When you think about having a few drinks during a night out, cosplay contests and video game tournaments are probably not what first spring to mind. But at The Queue Tavern, located at 905 Barksdale Blvd. in the new East Bank District, that would be just a normal Friday night. 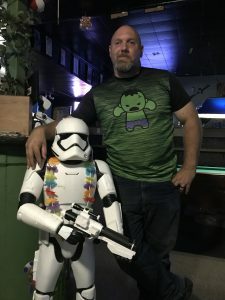 The bar has the unique position of being Bossier City’s only geek culture night spot, otherwise affectionally known as a “nerd bar”. The Queue is your average bar, except it’s filled with pop culture memorabilia, and serves several signature drinks based off nerd culture — including the Blue Screen of Death, the Ctrl Alt Delete, the Mighty Morphin’ Megazord (which is actually three drinks in one), and the Marvel comics inspired Infinity Gauntlet. In addition, the bar features a 120-inch screen for patrons to partake in both modern and retro gaming. The Queue also hosts weekend events, such as a cosplay contest this past weekend that tied in with the Geek’d Con in downtown Shreveport, or TV marathons, like the Doctor Who marathon scheduled for this upcoming weekend, August 26th. There are also specials such as “Geeks Who Drink” trivia and “Gamer Girl Night” with ladies’ drink specials on Wednesday nights. But with all the themes available, why a nerd bar? It’s because Owner Christopher Davis is a nerd himself. He originally envisioned it to be more of a gaming type of venue before it was broadened to be more inclusive of geek culture. But Chris says you don’t have to be a geek to drink here. For someone who has a day job, providing a safe haven for various types of patrons is what inspires Chris to open the doors each night, no matter how long or hard of a day he’s had. Having been in night club/bar industry for 20 years, his experiences made him want to be an owner so he could create a welcoming, fun environment. Something that will play in his favor is their location in the new downtown redevelopment. Previous Post:Are These The Best Louisiana Bites In Bossier?